His best-known performances as Alastor Moody in the Harry Potter films from (2004-2010). And for his supporting roles in films such as Braveheart (1995), Michael Collins (1996), Gangs of New York (2002), Cold Mountain (2003), Troy (2004), Suffragette (2015), Paddington 2 (2018), and The Ballad of Buster Scruggs (2018). As well as leading roles in films such as In Bruges (2008), The Guard (2011) and Calvary (2014). 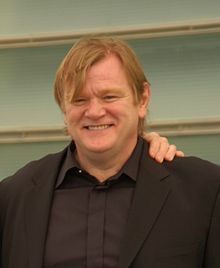 He is also the father of actors Domhnall Gleeson and Brian Gleeson. Gleeson was born in Dublin, the son of Pat and Frank Gleeson. Gleeson has described himself as having been an avid reader as a child. He received his second level education at St Joseph's CBS in Fairview, Dublin where he was a member of the school drama group. After training as an actor, he worked for several years as a secondary school teacher of Irish and English at the now defunct Catholic Belcamp College in North County Dublin, which closed in 2004. He was working simultaneously as an actor while teaching, doing semi-professional and professional productions in Dublin and surrounding areas. He left the teaching profession to commit full-time to acting in 1991. 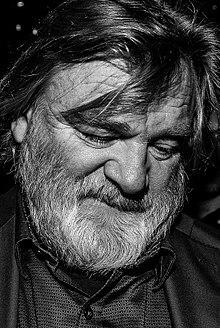 In an NPR interview to promote Calvary, he revealed that he was abused by a Christian Brother, saying, "I remember a particular Christian Brother dropped the hand on me at one point. It wasn't very traumatic and it wasn't at all sustained, it was just one of these things where something odd happened." Gleeson started his film career at the age of 34. He first came to prominence in Ireland for his role as Michael Collins in The Treaty, a television film broadcast on RTÉ One, and for which he won a Jacob's Award in 1992. He has acted in such films as Braveheart, I Went Down, Michael Collins, Gangs of New York, Cold Mountain, 28 Days Later, Troy, Kingdom of Heaven, Lake Placid, A.I. Artificial Intelligence, Mission: Impossible 2, and The Village. He won critical acclaim for his performance as Irish gangster Martin Cahill in John Boorman's 1998 film The General. While Gleeson portrayed Irish statesman Michael Collins in The Treaty, he later portrayed Collins' close collaborator Liam Tobin in the film Michael Collins with Liam Neeson taking the role of Collins. Gleeson later went on to portray Winston Churchill in Into the Storm. Gleeson won an Emmy Award for his performance. Gleeson played Hogwarts professor Mad-Eye Moody in the fourth, fifth and seventh Harry Potter films. His son Domhnall played Bill Weasley in the seventh and eighth films. In July 2012, he started filming The Grand Seduction, with Taylor Kitsch, a remake of Jean-François Pouliot's French-Canadian La Grande Séduction (2003) directed by Don McKellar; the film was released in 2013. In 2016, he appeared in the video game adaptation Assassin's Creed and Ben Affleck's crime drama Live by Night. In 2017 he finished Psychic, a short he directed and starred in. Gleeson is a fiddle and mandolin player, with an interest in Irish folklore. He played the fiddle during his role in Cold Mountain, Michael Collins and also The Grand Seduction, and also features on Altan's 2009 live album. In the Coen Brothers' The Ballad of Buster Scruggs (2018), Gleeson sings "The Unfortunate Rake." He has also made a contribution in 2019 to the new album by Irish folk group 'Dervish' with a version of 'The Rocky Road To Dublin'. He has been married to Mary (née Weldon) since 1982. He has four sons; Domhnall, Brían, Fergus, and Rúairí. Domhnall and Brían are also actors. Gleeson speaks fluent Irish and is an advocate of the promotion of the Irish language. Gleeson is a fan of English football club Aston Villa, as is his son Domhnall. 2018 The Ballad of Buster Scruggs Irishman (Clarence) Segment: "The Mortal Remains"
1993 Screenplay Thomas Macken Episode: "Love Lies Bleeding"
^ "Brendan Gleeson reveals abuse by Christian Brother". Independent.ie. ^ "Irish Theatre Institute's Playography database". Irish Theatre Institute. ^ "STARS WHO HIT IT BIG AFTER 30". The Hype. Archived from the original on 23 August 2013. ^ "The Devoted Friend". Wilde Stories. Channel 4. Retrieved 30 December 2011. ^ Gleeson, Sinead (16 July 2011). "Capturing the Glee Factor". Irish Times. Retrieved 18 July 2011. ^ Fleming, Mike (30 July 2012). "Brendan Gleeson, Taylor Kitsch Find 'The Grand Seduction'". Deadline Hollywood. PMC. Retrieved 25 August 2012. ^ "Altan EPK". Mpibands.com. Archived from the original on 9 October 2011. Retrieved 1 February 2012. ^ "Hugh Grant joins Paddington sequel as shooting begins".